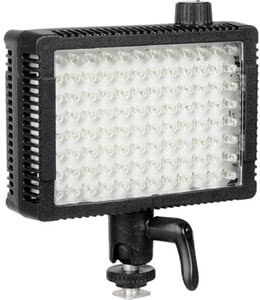 Litepanels MicroPro LED Hotshoe Light is a simple, easy-to-use LED light that mounts to your hot shoe and is powered for approximately 1.5 hours on 6 AA batteries. The head is tiltable and the light is dimmable. This light measures only 5.5" on the longest side and is ideal for events, accent lighting on small items, parties, and providing fill for quick, environmental interviews.